[User Submitted] Actually in Sandiego borders with Jamacha rd. in Spring Valley. 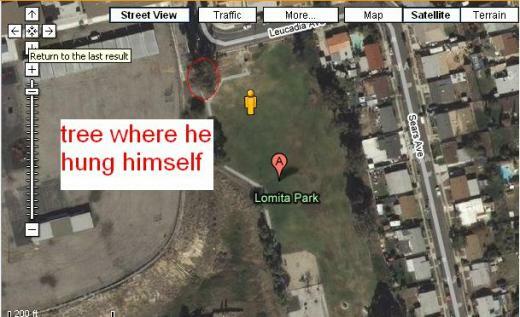 Lomita Village park is the actual location. Back in the 1980′s a vagrant hung himself from a tree in the park. Besides this the park is a gang area, where many violent things have happened. There are many reports from, voices, strange lights, and apparitions. Jim Weebee aka: James Bacon. He had a good job at Rhor Ind. & lived down the stairs on the southwest side of Audubon school & Lomita Park. Unfortunately the hood got the best of him & he became an alcoholic drug addict and was kicked out of his parents home. Me & my buddies felt bad for him so we let him stay in our underground fort we had made as youngsters in the canyon in back of 804 Bonsall St. He wasn’t doing that bad down there. It had wall to wall carpeting, a front door & rear escape door, a fireplace, & dug deep enough to stand up in w/o hitting your head on the ceiling (plus all that earth kept the place warm 24/7). We would all take turns bringing him extra plates of food, and leftovers daily. But during one wet winter it was flooded to the roof & while we were at school we heard SDPD came and tore it down. With nowhere else to go Jim settled into Lomita Park as his new home but was often harassed by some of the gangsters that called the park their turf. I didn’t actually see the hanging but I remember a couple of stories: 1)He committed suicide,tired of being homeless, wanted easy way out of his cruel world. 2)The LV70′s murdered him & he was found hung with the chain wrapped around his neck, dangling from the swing sets in the park. Since then the city has bulldozed & reconfigured the entire park including the infamous swings that would continue to sway back & forth with no one in them, in the dead of night, with no wind blowing………was it Jim? ?